While there is one Catholic Church though, that Church is made present in 23 Churches. Yes, that is correct, there are 23 Catholic Churches, and only one of those Churches is the Western, or Latin Church. The other 22 Churches are collectively termed the Eastern Catholic Churches but they are by no means all the same. Some of the Eastern Churches include the Melkite, Maronite, Ukrainian and Coptic Churches. And nor are these Eastern Churches mere annexes of the Latin Church. 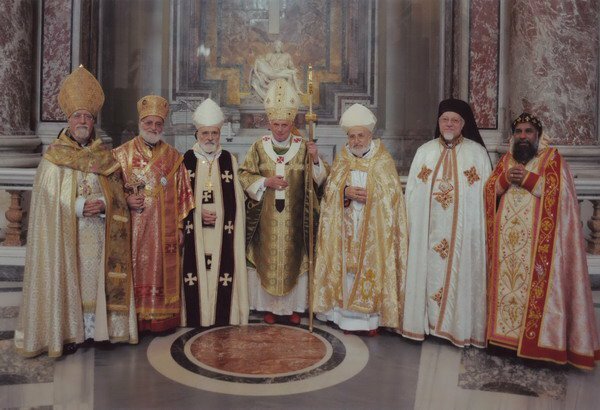 Each of the 22 Eastern Churches are autonomous and self-governing with their own Patriarch, Major Archbishop or Bishop. While these Churches were born in places such as the Middle East, India and Eastern Europe, they are not primarily cultural groups in the same way as one might be a French Catholic or an Indonesian Catholic (both of whom are still members of the Latin Church). Each of the 22 Eastern Churches preserve unique liturgical, devotional and theological traditions that demonstrate the authentic universality of the Catholic Church. For the most part, the Eastern Catholic Churches choose their own Bishops yet they remain Catholic because they are in full communion with the successor of Peter. But how did the Eastern Catholic Churches come about? First the obvious. Jesus was not a citizen of Rome and he did not speak Latin (or English). He lived and ministered in the Middle East which was in his time under the Rule of the Roman Empire. For close to 300 years after Jesus, the new Christian religion suffered heavy persecution at the hands of that Empire. It was the baptism of the Emperor Constantine in 313AD and the eventual declaration of Christianity as the official religion of the Empire which saw the Christian faith injected into the Western world in a way that shaped deeply the Europe we know today. However, while the structure of the Roman Empire shaped the way that Western Christianity would pray and think, Eastern Christianity continued to grow and take shape in its own place, understanding itself differently yet preaching the same Christ. Unfortunately these differences in tradition and mindset were not always understood by the other, and in 1054 the Christian Church was split by the tragic misunderstanding of the great schism where the West excommunicated the East, and the East excommunicated the West, giving rise to the division known today of Catholic and Orthodox. While the Orthodox Churches have a valid priesthood and sacramental system, the fundamental difference is that the Orthodox do not recognise the Bishop of Rome as having the kind of teaching and governing authority which the Catholic Church claims. For almost four hundred years after the schism the divisions continued without any real healing or attempt at understanding, but slowly some groups within the various Orthodox Churches felt it important to restore communion with the Catholic Church. The reunification of individual Eastern Churches began in the 16th century with the latest reunification as recently as 1930. The restorations of unity have not always been understood by the hierarchy of the Western Church with numerous examples of Eastern Catholic Churches forced to take on Western Church liturgical and devotional practices. The Second Vatican Council though spoke strongly about the need for the Catholic Churches of the East to maintain their identity. Some decades later, Pope John Paul II famously wrote about the Catholic Church needing to breathe again with both lungs, East and West.